Peel and dice sweet potato into small 1cm or smaller cubes. Boil for 10-15 minutes in a slightly salty water until soft, don't worry about overcooking. Drain in a colander when cooked and let it cool down to a room temperature. Place flour, diced butter and salt into your food processor and 5-6 times pulse on highest speed to mix the butter with flour. Pour in the water and immediately start pulsing to mix it into lumpy dough, but don't overdo it to prevent sticking to the food processor. Scrape the dough onto your work space and knead using your palm heels for 2 or 3 minutes until the dough is smooth, firm and springy. You can add some flour in case it's too sticky, and in such case use a scraper to remove it from the work space. Pack the dough into a plastic wrap and refrigerate for at least 2 hours to firm it up. When the dough is firm and cold, remove it from the plastic wrap and roll it with a pin to the size of the bottom of your quiche/tart form, adding about 2.5 cm (1 inch) extra space for the walls. Gently move the dough into the form and press it lightly to the bottom, then to the walls, and then remove the excess dough from the rim, but pressing it on the edge. 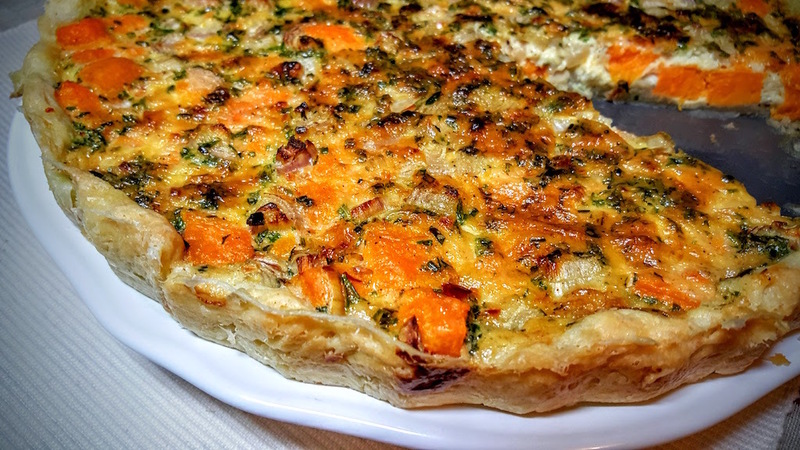 Fill the quiche shell with sweet potato cubes and distribute it evenly across whole surface. You can use a spatula to even it out and gently press down. 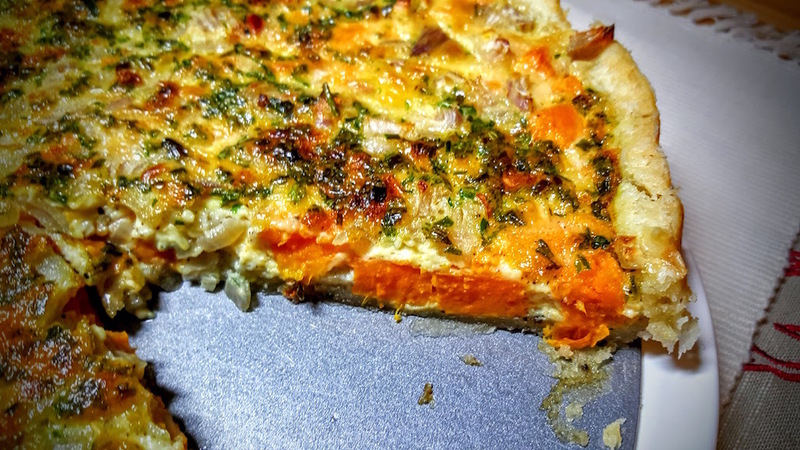 Finely chop the shallots and sprinkle sweet potatoes with it. Combine the eggs with enough cream to make 1 cup of custard, then whisk in garlic powder, black pepper, and herbs. Pour the custard over the sweet potatoes and shallots, and distribute into empty spaces with a spatula, fork, or knife. Preheat the oven to 180°C and bake the quiche for 35 minutes — the custard can rise and should have a nice, brown color. The pie shell will have a light- to golden-brown color. 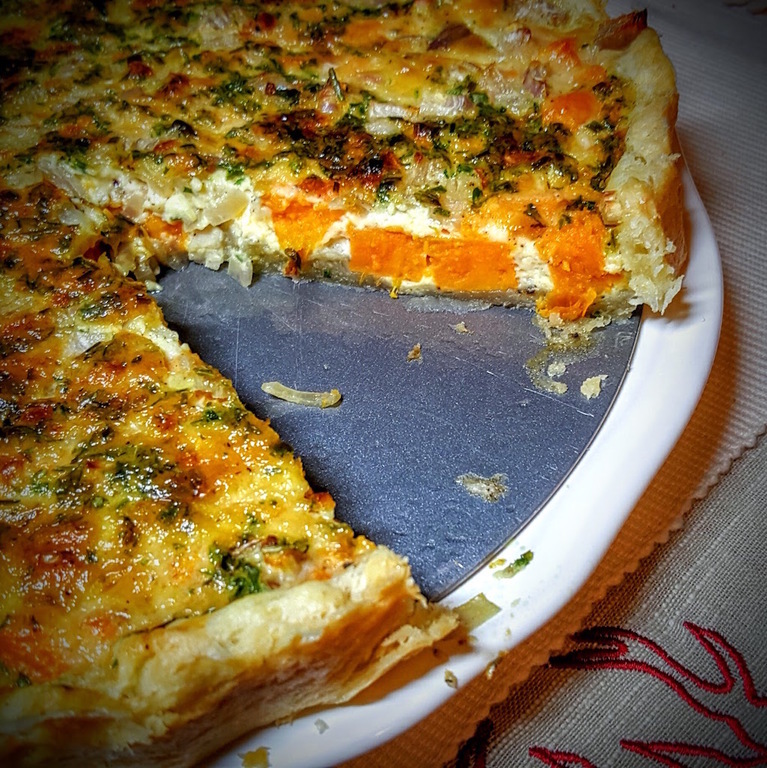 You can serve your sweet potato quiche hot (if you bake it in a ceramic or glass form), or chilled to room temperature (if you need to remove it from a metal form), with some salad or white wine.